It's embarrassing to try a set of irons on a range and not like them. It's embarrassing to swing the clubs and duck hook a few. It's embarrassing to complain about how you can hit other irons better, even Titleist irons like the DTRs. What is so embarrassing about this, you may ask? It's embarrassing to come back home to write the review and read some specs on the clubs and discover that they were "designed with the better player in mind." Ugh. That means the clubs that were professionally designed for someone good to use were very difficult for me to hit. That means that the high performance blade with a variable muscle back cavity are not necessarily "my cup of tea." That means that these clubs are for people who care about "workability" with their shots, and not just considered with "taking some time off work" to sneak off to the course and duff a few. 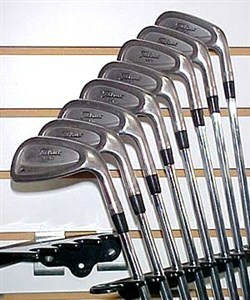 Maybe I would have had better luck with these clubs back when they were brand new in the early 2000s. Yeah, that's it. I would have gripped and ripped these things a country mile, but I'm older and need something more modern to help me with my game. They are definitely worth the try -- especially if you're a golfer that has some natural talent and ability and may be looking for a very good set of used clubs. Clubs designed for... (start my sarcastic whiny voice) -- "the better player in mind."